An all-inclusive fishing package in the last frontier awaits. 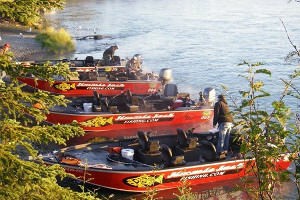 Located on the bluff of the sea overlooking Cook Inlet near Kenai, Alaska, rests Jimmie Jack’s Alaska Fishing Lodges. Jimmie Jack’s is considered the “most recognized fishing lodge in Alaska” with over 20 years of catering to the distinguished fishermen and novices alike. There is nothing quite like hitting the open sea. The smell of the fresh, warm summer air. The slow and steady rock of the boat. The adrenaline running through your veins in anticipation of catching that prized salmon, halibut, or lingcod. Jimmie Jack’s gives visitors everything they’re looking for and much, much more. Jimmie Jack’s offers four unique Alaska SeaScape fishing packages ranging from 4-7 nights in length. Each SeaScape lodge package includes daily professionally guided tours on superior boats with all tackle and gear provided, complimentary fish processing, and lodging with wine and drinks, appetizers, and the fine dining experience in the evening. Depending on the package, each person who embarks on a guided fishing trip will have a chance to catch a Kenai River king salmon, lingcod, black rockfish, yellow-eye rockfish, silver salmon, Cook Inlet halibut, Homer halibut or Kasilof River king salmon. “The three times we have been at Jimmie Jack’s, they have provided outstanding service, quality fishing, and made us feel more like a friend than a client,” said guest Jerry Wiedner. Jimmie Jack’s offers a true fine-dining experience at the Alaska SeaScape Lodge. Daily meals include a hearty breakfast, boat lunch, and late-afternoon appetizers. Then--after a glorious day on the sea--indulge in a dinner menu that is to die for, including a choice of house smoked prime rib, steak, Alaskan king crab, pacific halibut, salmon, jumbo prawns and scallops. Enjoy a complimentary Pacific Coast wine and stay for the delectable homemade dessert. 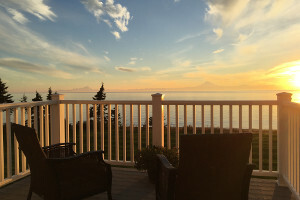 The fishing lodges are located on the bluffs of beautiful Cook Inlet with grandiose views of the Cook Inlet and the Alaska mountain range. The lodge decks are a perfect place to relax with a glass of wine and a good book while the pristine waters crash onto the beach far below. Also available at Jimmie Jack’s are 8-hour fishing charters and Jimmie Jack’s ‘Original’ Alaska Lodge packages that last 5-7 days in length and are also all-inclusive. Jimmie Jack’s has become the most recognized name in Alaska fishing with over 15,000 guests served since 1995. A four-time winner of the TripAdvisor Certificate of Excellence, Jimmie Jack’s has over 80 years of combined professional guide experience, a spectacular beachfront location, top-of-the-line equipment, safe and modern fishing boats, and unparalleled scenery and wildlife. Catching that trophy fish has never been easier or more fun, come stay and see why.